Nevro Corp. (NVRO) is among a host of public and private companies marketing or developing medical devices to treat pain. These companies are striving to develop alternatives to opioids for the some 50 million people in the U.S. that experience chronic pain daily or almost daily. The opioid crisis has been well documented. Every day, more than 130 people in the country die after overdosing on opioids, according to the National Institute for Drug Abuse. These include prescription pain medications, heroin and synthetic opioids such as fentanyl. The abuse of these drugs is nothing short of a catastrophe, causing unold human misery, tearing at the very fabric of society and costing billions annually. Warning! GuruFocus has detected 2 Warning Signs with NVRO. Click here to check it out. Medical device companies that can help reduce opioid use promise to be rewarded handsomely and merit the attention of savvy investors. Consider that MarketsandMarkets estimate values the global pain management device market to reach more than $4.6 billion by 2021, according to a December article in Medtechdive. Nevro is one of the biggest companies in this emerging industry, with a market capitalization approaching nearly $2 billion. Based in Redwood City, California, the 13-year-old company markets worldwide its Senza spinal cord stimulation system for pain. Nevro shares jumped more than 35% to nearly $61 on March 20, fueled in great part by takeover speculation as a result of appointing a new CEO, Keith Grossman, who has overseen the sale of two industry companies. Under his watch, Thoratec Corp. was sold to St. Jude Medical and Bayer (OTCPK: BAYRY) acquired the women's medical device firm Conceptus that he was heading. Something was needed to buoy the company's stock. It had been floundering during the past year, losing more than 55% of its market value between March and November 2018. 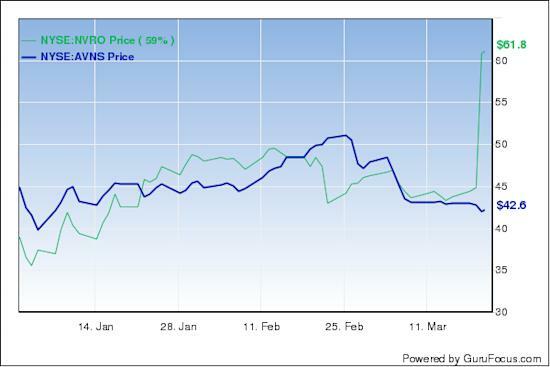 Although it's not making money, Nevro is favored by analysts. Of the 10 following the company, five have it as a strong buy and an equal number rated it a buy. Avanos Medical (AVNS) is another big industry player. It offers Game Read, a product for pain management and rehabilitation of patients recovering from orthopedic surgery or sports-related injuries, as well as a portfolio of products serving other treatment areas. Unlike Nevro, Avanos has positive earnings. It beat the Zacks estimate by earning 30 cents in the fourth quarter of 2018, according to an article on Yahoo Finance. That was the good news. The flip side was that earnings were down nearly 60% from the same quarter of 2017. On top of that, Avanos said it expects adjusted earnings between $1.15 and $1.35 per share this year. Even if it hits in the middle, the number will fall short of the Zack's estimate of $1.29. Shares of the company declined slightly on the disappointing results and outlook. Avanos trades Thursday at more than $42, off 40% from its 52-week high. Far smaller public companies with technology products to treat pain include Brainsway (OTCPK: BRSYF) and NeuroMetrix (NASDAQ: NURO). Disclosure: The author hold no positions in any of the companies mentioned.